Here's an evocative bit of Middlewich ephemera. 'Number 28' on Hightown has in recent years become so firmly established as a 'drop-in' centre run by the nearby St Michael & All Angels church - in effect serving many of the purposes of a church hall combined with a community facility - that it comes as a bit of a shock to realise that the building has had many previous lives since its beginnings as one of a plethora of Co-op shops established in the town in the early part of the 20th century. Many will remember it as the second premises of Harold Woodbine Ltd, the first premises, not too far away in Lower Street, having been demolished in the early 1970s to allow St Michael's Way to be built. The original shop was approximately where the taxi rank opposite the Bull Ring bus stop now is. Even when the retail shop at No. 28 closed, Woodbine's electrical contracting business continued to occupy the rear of the premises. The business has now moved to Sandbach. 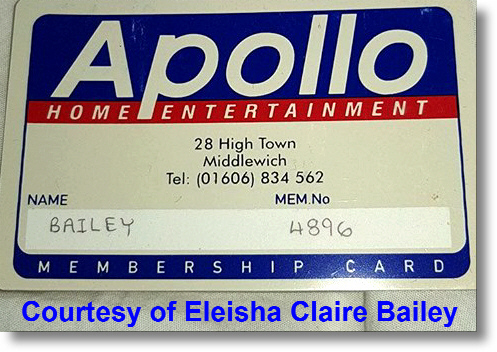 And for a short period starting in the mid-to-late 1990s the shop was part of the video lending boom, as can be seen from this membership card. The fact that the shop's telephone number has a '1' in it shows us that the card must have been issued after the 16th of April 1995 (prior to that date all Middlewich numbers began 0606 83) but that doesn't, of course, preclude the shop being open before that date. In the 1980s and 1990s video, and later DVD, hire was popular in Middlewich,as elsewhere. The huge, clunky VHS cassettes were invented in the early 1970s and and lasted until 2008 when DVDs, which started to become available around 1995, finally'overtook them in popularity. VHS videos have vanished so completely from most people's lives that its probably necessary to remind everyone what they actually looked like. The remaining lifespan of Apollo Home Entertainment almost exactly paralleled that of the VHS cassette. The company, which was based in Sussex and had branches all over the country, soldiered on, closing many branches each year, until the 30th of August 2016 when it was wound up. This was just a month after the very last VHS equipment was made. But can anyone tell us the year that the Middlewich branch closed? Nowadays, of course, even the DVD has fallen from grace as the downloading and streaming of movies and TV programmes from the internet grows in popularity. Many thank to Eleisha for permission to use her photo.